World rated middleweight Osumanu Adama, 30 years-old from Ghana, based in Miami, Florida, scored the biggest win of his career with a ninth round TKO over former IBF jr.middleweight champion Roman Karmazin, 38 years-old from Russia based in Los Angeles, California. 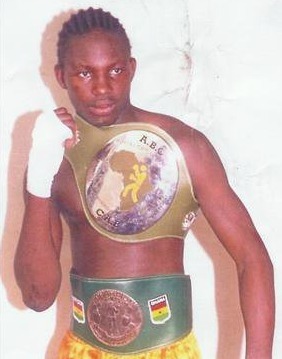 Adama, IBF #7, won the IBF 160-lbs title eliminator when wobbled “Made in Hell” Karmazin in round five with a left hook and had him going again in rounds eight and nine before Karmazin’s corner threw in the towel. Time was :0.58. Karmazin, 40-5-2 (26 KOs), has been inactive since last October's knockout loss to Daniel Geale. He took time off and appeared to be retired, but returned for this title eliminator opportunity. Adama improved his record to 20-2-0 (15 KOs). The welterweight co-feature between former world champion Vivian Harris and Jermaine White was cancelled. In a ten-round middleweight bout “Murder” Eric Mitchell, 23-7-1 (11 KOs), won a 10 round a split decision over local favorite “Superman” Derrick Findley, 18-7-0 11 KOs). The scores were 95-94, 96-93 for Mitchell and 95-94 for Findley. Lowell, Massachusetts boxing legends “Irish” Mickey Ward and uncle Dicky Ecklund worked the corners of super middleweight “Irish” Joe McCreedy and super-lightweight Sean Eklund. Joe McCreedy, 15-5-2 (6 KOs), outpointed Loren Myers, 8-13-1 (2 KOs) over eight rounds by scores of 77-75, 79-73, 78-74, while Sean Eklund, 10-4-0 (2 KOs) won a six-round unanimous decision over Terry Buterbaugh 6-6-2. The scores were of 59-57, 60-54, 58-56. At heavyweight Boban Simic made a successful debut by stopping Caleb Grummet, 1-2-1, in round three and former amateur star Junior Wright blasted out Darrion Fletcher after just 0.58 in a light-heavyweight clash.